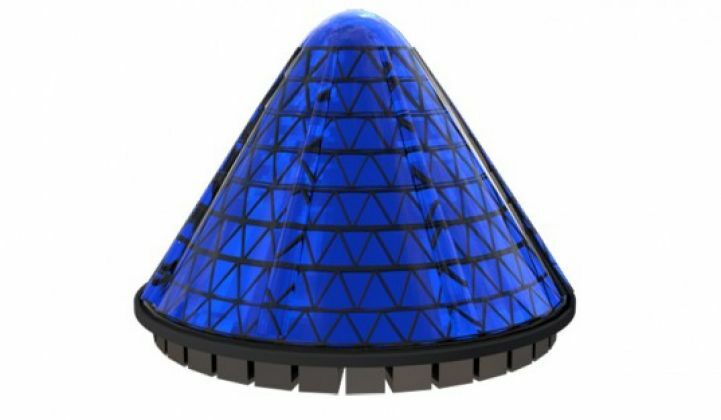 The V3Solar concentrating PV product spins and cools itself, harnesses a hypothesized "penumbra effect" to generate more power, and threatens to provide power from the sun at a levelized cost of $0.08 per kilowatt-hour. Can potentially produce alternating current output without an inverter. According to Cleantechnica's source, V3Solar has over 4 gigawatts' worth of "requests for orders." Bill Rever, formerly of BP, was hired by V3Solar as an independent consultant (and was introduced to the firm by Jigar Shah, according to Rever). Rever has an endorsement on his LinkedIn page from solar analyst Paula Mints saying, "Bill has a deep and insightful understanding of the solar industry. His expertise in strategic market planning is extremely valuable in the complex market for solar technologies." In his report, Rever writes,"The V3Solar system is fundamentally a rotating assembly of photovoltaic cells under a structure of lenses that concentrate light onto the moving cells," adding, "Overall, V3Solar appears to have a concept that can carve out a solid place in the solar and overall electricity market and is pursuing a sound strategy in examining and understanding the details of the technology to provide the best possible initial design." He continues, "The most fundamental innovation is the ability to use one-sun cells in a concentrating system operating at 20X concentration or above. The main issue to resolve is temperature, which at 20X concentration can quickly rise to destructive levels unless heat transfer out of the cell is enhanced. Tests conducted by V3...show that the spin cell concept can solve this problem." Rever has some real solar experience from his time at BP, but still says, "If V3Solar were to only garner 0.1 percent of today’s global PV market, this would represent approximately $100 million per year in revenue, and a 1 percent share would represent roughly $1 billion in sales. If V3Solar can achieve its goals for cost, performance, and reliability, a significant penetration seems likely." Solar modules will have a cost of $0.42 per watt in 2015, according to GTM Research. According to LinkedIn, V3Solar's Chief Marketing Officer is Robert Styler. Styler was formerly the president of the sales division of Citizenre and also worked at Equinox International, a multilevel marketing exercise. Michael Neistat is CEO of the firm. Christoph Karl La Due is the Chief Inventor and Director of Technology at V3Solar. The "4 gigawatts" remark is one red flag. The Citizenre connection is another issue. I'll leave an assessment of the technology to the technologists -- when a prototype is ready for testing.